Farming is a scientific profession at its core. The practice is essentially an exercise in chemistry: nutrients go into the soil, plants use these nutrients, and chemical imbalances can throw the whole system off-kilter. Yet practicing farmers have neither the time nor the resources to engage in experimentation. So where have modern agriculturalists gotten relevant scientific information to improve their methods? For over a hundred years in the United States, the answer has been the country’s Agricultural Experiment Stations and the Farmers’ Bulletin. 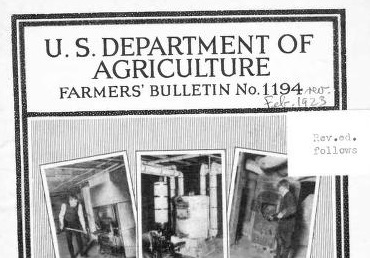 Beginning in 1889 and continuing into the twentieth and twenty-first century, the United States Department of Agriculture’s Farmers' Bulletin has long been a quintessential source of information for agriculturalists throughout the country. 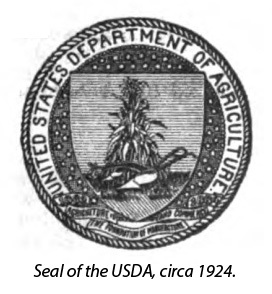 The USDA covered a veritable trove of subjects through the Bulletin, designing the pamphlet to be easily understood by a wide audience with frequent drawings and tables to supplement the text. This first German station had grown from a loose organization of Leipzig farmers who sought the aid of a nearby chemist to perform research on their behalf. In 1851, the farmers were granted government assistance to open a proper experimental station. By 1866, thirty such stations existed across Europe. 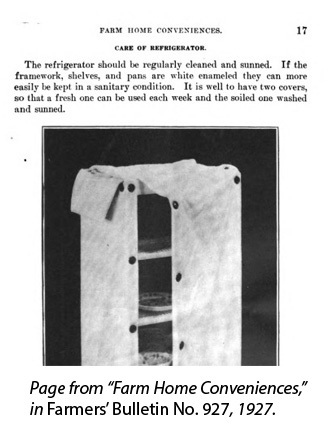 Another Bulletin from 1918 catered to the homemaking set by discussing the benefits and drawbacks of the new “iceless refrigerator” in relation to the simpler-to-operate “cold box.”8 (Spoiler: since the iceless refrigerator relies entirely on evaporating water, significantly decreases in effectiveness in the summer.) Yet another Bulletin from 1898 outlined the prevailing understandings of milk as a viable food, giving a snapshot of food science at the turn-of-the-century.9 Opening a Farmers’ Bulletin, you may be surprised by what you find! Users of 19th Century Masterfile: 1106 – 1930 can access every Farmers’ Bulletin published from 1889 until 1930. Check your institution’s database subscriptions to find if you have access to 19th Century Masterfile, or sign up here for a free trial. “The What and Why of Agricultural Experiment Stations,” Farmers’ Bulletin, No. 1 (Washington: U.S. Dept. of Agriculture, Government Printing Office, 1889), 11. Ellen Kay Miller, Index to USDA Farmers' Bulletins, U.S. Department of Agriculture, accessed April 2, 2018, https://pubs.nal.usda.gov/sites/pubs.nal.usda.gov/files/fb.htm; “Cutworms and Their Control in Corn and Other Cereal Crops,” Farmers’ Bulletin No. 739 (Washington: U.S. Dept. of Agriculture, Government Printing Office, June 1916); “Control of the Argentine Ant in Orange Groves,” Farmers’ Bulletin No. 928 (Washington: U.S. Dept. of Agriculture, Government Printing Office, March 1918); “Single-Phase Electric Motors for Farm Use,” Farmers’ Bulletin No. 1858 (Washington: U.S. Dept. of Agriculture, Government Printing Office, September 1961). “Chimneys & Fireplaces,” Farmers’ Bulletin No. 1230 (Washington: U.S. Dept. of Agriculture, Government Printing Office, Dec. 1921). “Farm Home Conveniences,” Farmers’ Bulletin No. 927 (Washington: U.S. Dept. of Agriculture, Government Printing Office, March 1918). “Milk as Food,” Farmers’ Bulletin No. 74 (Washington: U.S. Dept. of Agriculture, Government Printing Office, 1898).